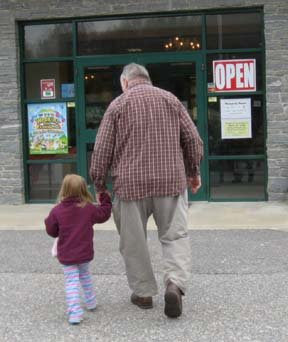 I had the week off and that meant time to spend with our granddaughter. Our choice for a day of fun was Nature's Art in Montville. We spent Tuesday afternoon at Nature's Art, a family oriented activity center featuring activities with fossils, life size dinosaurs, gems, rocks and minerals. 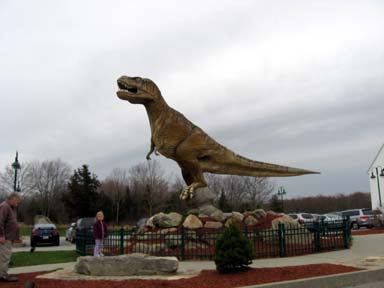 http://www.thedinosaurplace.com/ . We started by looking at all the interesting things in the gift shop, from gems to stuffed dinosaurs. 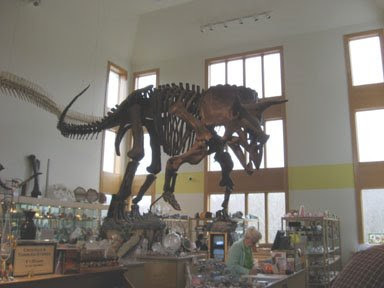 Then we visited the fossil room which has replicas of dinosaur skeletons. When we first went in, the Princess says in a shaky voice, "I'm scared, will you keep me safe?". The when she saw a skeleton of TRex's head she said, "Look, TRex, he's smiling". Then she looked up at the ceiling and said, "Look, a teradactile". We weren't quite ready for lunch so we went downstairs to mine for gems. After each find, the Princess had to announce, "Look, I found one", to the young man supervising the dig. Then we had lunch, visited the fossil room again, and then headed for home.